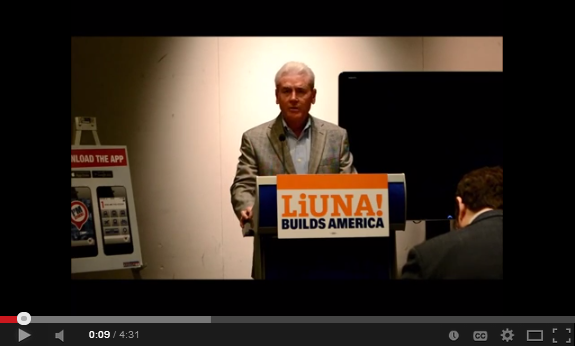 Washington, DC (May 12, 2014) – LIUNA – the Laborers’ International Union of North America – today unveiled its new creative media campaign to press Congress to pass a long-term, full-investment Highway Bill this year. The campaign includes provocative, hard-hitting billboards, radio ads, online tools and events and activities around symbolic props. The average bridge in the U.S. is 46 years old, dangerously close to the average lifespan of 50 years. On average, 25 bridges collapse each year in the U.S. According to the transportation research group, TRIP, potholes and poor road conditions contribute to a third of all traffic fatalities every year. Joining O’Sullivan at the “Infrastructure Week” briefing at the Newseum were leaders from Building America’s Future, the American Road and Transportation Builders Association, the American Automobile Association and Associated General Contractors of America. Marcia Hale, President of Building America’s Future, highlighted their new web application – the “I’m Stuck” app – which is designed to help drivers speak out about deteriorating highways in their area. “We think it’s really important for the people who need to vote on the transportation bill and the Highway Trust Fund to hear directly from their constituents,” she said. The gas tax was last adjusted in 1993. Its value has decreased 40 percent since then due to rising construction materials costs and more fuel efficient cars. The briefing comes as the Senate Environment and Public Works Committee reveals the details of a new multi-year bill. Obama Administration officials also introduced a plan of their own. And Oregon Rep. Earl Blumenauer has introduced a bill to adjust the gas tax to save the Highway Trust Fund, which faces a multi-billion dollar shortfall this summer, according to the Department of Transportation.